Check fertilizer injectors prior to each crop cycle to be sure they are operating accurately. This can be done by testing the electrical conductivity (EC) of the fertilizer solution and comparing the results to an EC chart from the fertilizer manufacturer. To check a fertilizer solution, use a good conductivity meter or send a sample to the University of Massachusetts soil test laboratory, http://ag.umass.edu/soiltest. Match fertilizer application with plant nutrient needs as the plant grows. Consider plant growth rate and environmental conditions as part of a nutrient management program. Avoid excess leaching to reduce ground water contamination. Stop or limit nutrient and water loss from irrigation and leaching by containing the effluent and by reducing the leaching fraction waste during watering. When choosing a fertilizer consider the ratio of ammonium to nitrate-N, trace element charge, content of calcium and magnesium, and potential acidity or basicity. Consider the frequency of application when developing a fertilizer program. Consider the volume of fertilizer solution applied. When using controlled release fertilizers, choose the correct product for the particular crop being grown and use the correct rate rate. Most potting mixes have little ability to supply or retain nutrients in amounts to sustain plants without applications of fertilizer. Nutrients are delivered using various water-soluble fertilizers through a fertilizer injector, through the use of controlled-release fertilizers (CRF), or a combination of controlled-release and water-soluble fertilizers. Nitrates and phosphates from fertilizer are potential environmental hazards if they enter groundwater or surface water by runoff or leaching. Nitrate-N (NO3-N) is the major element of concern, but other elements are potential pollutants as well. Current standards for drinking water in most states, including Massachusetts, allow no more than 10 ppm NO3-N. Most fertilizer programs apply 200 - 300 ppm N and container leachates commonly have levels of NO3-N well above 10 ppm. If not used carefully, fertilizers and other agricultural chemicals can contaminate both ground and surface water. Buffer zones around water bodies and well heads, using only the nutrients necessary, and other practices can help to minimize these problems. Nutrient management is key not only to crop health, but also to protecting water resources. Fertilizer proportioners or injectors are used in liquid feeding systems to eliminate the need for large volumes of stock solution tanks. They allow for the measured injection of highly concentrated fertilizer solutions. 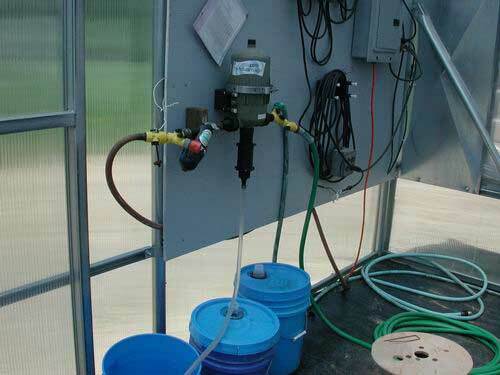 These devices "inject" a small quantity of concentrated fertilizer solution (stock solution) into the irrigation line so that the water leaving the hose (dilute solution) supplies the proper concentration of fertilizer. Most growers apply water-soluble fertilizers at a dilute concentration on a "constant feed" basis (with mostly every watering) to insure an adequate supply of the essential elements for plant growth. Rates of fertilization are often given in parts per million (ppm) of nitrogen (N), which is a way of expressing fertilizer concentration. One ppm is equivalent to 1 milligram/liter (mg/l). It is important to remember that an injector does not deliver a fixed ppm N. The amount of fertilizer to dissolve per gallon of water (stock solution) to make the appropriate concentrate for a specific injector setting needs to be determined. An injector setting of 1:100 indicates that 1 gallon of fertilizer concentrate delivers 100 gallons of final solution. This is not an indication that the injector is delivering 100 parts per million (ppm) nitrogen. Note that fertilizer should be measured by weight for mixing, not volume. Also, while color dyes are used to indicate the presence of fertilizer, fertilizer solution color is not a reliable gauge for fertilizer concentration. For more information on injector ratios, ppm Nitrogen and fertilizer calculations. Some injectors (Hozon, Smith) have a fixed (nonadjustable) injector ratio whereas other injectors (Dosatron, Anderson, Dosmatic) have adjustable ratios. Many growers prefer injectors with adjustable ratios so that different fertilizer rates can be applied to crops with different nutrient requirements. Many injectors have dual settings, in percent and ratio. A 1 percent setting is the same as a 1:100 ratio, a 2 percent setting is the same as a 1:50 ratio and a 0.5 percent setting is the same as a 1:200 ratio. Let plain water (no fertilizer) run a little, then collect water in a clean bucket. Take a sample of the plain water from the bucket. Check the EC of the untreated water supply. Mix up your fertilizer as you normally do and run it through the injector and hose. Let it run a little to be sure you get an accurate sample. Fill a clean bucket with fertilizer-injected water from the end of the hose and use your meter or soil test laboratory to check the EC of the sample. Subtract the EC value of the untreated water from the EC value of the fertilizer water. Compare the results to an EC chart from the fertilizer manufacturer or fertilizer bag. The chart will correlate the EC measurement with the ppm nitrogen so you can determine if your injector and mixing procedure is accurate. The reliable proportioner makes liquid feeding of crops a simple procedure, but the output from the proportioner must be monitored and the chemicals in the stock solution must be compatible and mixed properly. Some chemicals are not compatible in highly concentrated stock solutions because they form solid precipitate. The most common problems occur when fertilizers containing calcium are mixed with fertilizers containing sulfate or phosphate, or if iron compounds are mixed with phosphate. This can be solved using a twin-headed injector or by using two injectors. Fertilizer injectors should be checked periodically to be sure they are operating accurately. This can be done by testing the electrical conductivity (EC) of the fertilizer solution and comparing the results to an EC chart from the fertilizer manufacturer. To check a fertilizer solution, use a good conductivity meter or send a sample to the University of Massachusetts soil test laboratory, http://ag.umass.edu/soiltest. Match fertilizer application with plant nutrient needs as the plant grows. Stop or limit the loss of nutrients from the plant container during topwatering in an open system. It would be very useful when developing fertilizer programs to know the specific nutrient requirements of greenhouse plants both in amount and in time. Farmers of field crops have extensive information on how much N, P, or K is needed to grow a crop and at what time during crop development fertilizer will be most beneficial; unfortunately information of this type is very limited for the thousands of greenhouse crops. One approach to studying nutrient needs is to construct a "nutrient balance sheet" showing where the applied element(s) go and where improvements in fertilizer efficiency can be made. Fertilizers or fertilizer programs can be compared as in the example of 4-inch seed geraniums (Table 1). Here the plants received the same amount of N and water as they grew and where the fate of the N was kept track of until flowering. The balance sheet shows that the largest amount of N was recovered by the plants fertilized with ammonium nitrate; N leaching was greatest with ammonium sulfate and calcium nitrate; unaccounted for N (presumably lost as ammonia gas) was highest for ammonium sulfate and urea; and the amount retained by the potting mix was about the same for all N sources. The balance sheet clearly shows the magnitude of N loss by leaching and the importance of N source in maximizing fertilizer efficiency. Interestingly, about 1.0 gram of N was required to grow the geraniums in this study; a level very close to estimates made for other floriculture crops. Complete balance sheets for floriculture crops are rare because the research needed to construct them is expensive and time-consuming. Plant nutrient requirements change as the plant grows and enters new developmental stages (e.g., vegetative vs. reproductive). Ideally fertilizer should be applied during periods of highest demand and reduced or stopped at other times. Using this approach could reduce runoff and prevent harmful nutrient deficiencies or excesses. Some plants such as chrysanthemum and marigold have distinct vegetative and reproductive phases of growth and they show a pattern of increasing N uptake during vegetative growth and a leveling off or decline following the appearance of visible buds. Nitrogen is most critical during the vegetative phase and fertilization can be reduced after visible bud. On the other hand, New Guinea impatiens, which do not have distinct vegetative and reproductive phases and they show a continuous, gradual increase in N uptake as they grow. New Guineas do best with low fertility early on and fertilization becomes more critical as the plant gets older and larger. Nutrient uptake patterns have been determined for only a few crops, but some information is already available to enhance postharvest longevity and reduce nutrient runoff by reducing fertility in the latter stages of growth (Table 2). Easter lily Stop fertilization prior to marketing of lilies that are to be stored at 35 F. This will improve postharvest foliage color. These fertilizers are among the most popular for routine fertilization of spring crops. Both are high (>50%) nitrate fertilizers. However these fertilizers also have elevated trace element levels which may raise Fe and Mn to toxic levels at low pH. Both are acid-forming fertilizers (see the box), but 20-10-20 has the higher potential acidity (397 vs. 210). "Triple 15" is a good alternative to the Peat-Lite Specials for crops sensitive to trace element toxicities. Trace element levels supplied by this fertilizer are lower than the Peat-lite Specials. Otherwise, at the same rate of N, plant response will be very similar to 15-16-17. This is an acid-forming fertilizer also; the potential acidity (261) is slightly higher than 15-16-17. Growers who use this fertilizer on soilless media risk ammonium toxicity because the N in this fertilizer is 75% ammonium and urea. Some growers who use media containing soil do not appear have problems. If 20-20-20 is used, the growing medium should be tested frequently for ammonium especially during cool growing conditions. 20-20-20 supplies trace elements and has the highest potential acidity (597) of fertilizers commonly used in Massachusetts greenhouses. These fertilizers can be tried as an alternative to chemical growth regulators for bedding plants. This technique of growth control is sometimes called "phosphorus starvation". It is generally believed that more P than necessary is being applied to greenhouse crops. Fertilizer formulations with phosphorus levels of 5% or less are recommended. Too much P may cause plants to stretch and P is a pollutant. Unfortunately, in terms of height control, low P fertilizers will be of no benefit if they are applied to a growth medium containing superphosphate. On the other hand, there is a risk of P deficiency if the fertilizers are used continuously with low P growth media. More practical research is needed to learn how to use these fertilizers effectively. Use of this fertilizer combination greatly reduces the chance of trace element toxicities. Some growers alternate its use with the Peat-Lite Specials on a 2-3 week basis to supply Ca and to counter the acidic effect of the Peat-lites. However, both superphosphate and a trace element fertilizer must be incorporated in the growing medium if this combination is to be used as the sole fertilizer. Controlled-release fertilizers (CRF) are fertilizers that have an outer shell like an M&M candy that are released by temperature, and the presence of moisture. The coating protects the nutrients in the “prill” from releasing all at once. As water vapor enters the covered prill, pressure builds up on the inside and the ingredients in the prill will escape through pores in the coating. The release of nutrients varies depending on the technology used to formulate the coating. The basic principle with most CRF products involves taking a soluble form of fertilizer and coating it so it is "controlled release." The technology of the coating and how that coating affects the release is what makes each CRF product somewhat different. In addition to chemical fertilizers, some growers especially greenhouse vegetable growers are interested in using organic fertilizers. Organic fertilizers can be incorporated in the growing mix prior to planting to provide nutrients, used post-plant (fish emulsion) or a combination of the two. Incorporating bulk fertilizers like dried blood, bone meal, and rock phosphate in the medium before planting limits the control of nutrition as the plants grow, unlike water-soluble fertilizers. The growing media also plays an important role in organic nutrient management. For information on organic growing media, see section “Effects of Growing Media on Water and Nutrient Management”. Many organic bulk materials can be incorporated in the growing mix prior to planting to provide nutrients. How effective these materials are depends on the nutrient analysis, amount added, and the needs of the plant. The Organic Materials Review Institute (OMRI) maintains an extensive list of these materials on their website www.omri.org. The challenge when using these fertilizer materials is the rate of nutrient release and how it matches the nutrient requirement of your plants. Nitrogen is the most likely element to become deficient in both “traditional” and organic production. In most chemical fertilizers N is immediately available, but it is more slowly available in most organic sources. N in organic matter is released from complex molecules like protein, but it must be converted to ammonium and nitrate ions before it can be taken up by plants. This process is natural and occurs because of the activity of a number of bacterial species found in most potting media. This process can be unpredictable and it’s important that the mix be well-aerated and otherwise supportive of active microorganisms (so no chemicals!). It may be necessary to apply a “soluble” fertilizer after planting to boost the level of plant available nutrients. This is where liquid fertilizers like fish emulsion become important. Organic Materials Review Institute (OMRI) -approved liquid fish fertilizers are the closest organic fertilizer to water-soluble, chemical types in terms of application method. Liquid fish fertilizer can be used alone or as a supplement to pre-plant organic fertilizers. Liquid fish fertilizer has a very low NPK analysis (2-4-1), a rather thick consistency, and some users object to its odor. However, it has the advantage of being compatible with most equipment and systems growers already use to apply water-soluble fertilizer. It can be successfully used to fertilize plants including greenhouse tomatoes irrigated using drip irrigation. Since between 15 and 25% of the N in fish fertilizer is water-insoluble it may be necessary to increase the level rate of application. Providing the proper combination of pH and fertility requirements for specific greenhouse crops can be a challenge for growers. For information on rates, consult the greenhouse management fact sheets. Fertilizer type: Important considerations are ratio of ammonium to nitrate-N, trace element charge, content of calcium and magnesium, and potential acidity or basicity. Ideally no more than 50 percent of the total nitrogen supplied to plants grown in soilless media should be in the ammonium form. Ammonium toxicity can occur in soilless media due to high levels of ammonium or urea fertilizer. The toxicity occurs on some plants when the soil is cool and waterlogged, when the ammonium is converted to ammonia. Fertilizer rate: Traditionally fertilizer rate (ppm) has been the main focus of greenhouse fertilizer programs, but rate interacts with the other five factors on this list to determine the success of a fertility program. Frequency of application: How many times water-soluble fertilizer is applied is often overlooked as a factor in developing a good fertilizer program. What does the term "constant liquid feed" (CLF) really mean - every watering, once a week, or twice a week? At a given ppm level, more frequent applications will lead to a higher fertility level simply because fertilizer is applied more often. Volume of fertilizer solution applied: As the volume of water-soluble fertilizer increases the quantity of nutrients delivered to the plant also increases. Doubling the volume applied also doubles the amount of each nutrient potentially available to the plant. Leaching fraction: Leaching fraction is the proportion of fertilizer solution or irrigation water applied that is lost from the plant container by leaching. The lower the leaching fraction, the greater the quantity of nutrients and salts retained in the growth medium. Leaching fraction is strongly affected by volume applied (i.e., factor 4). Avoiding excess leaching is critical to reducing both fertilizer costs and ground water contamination. Lower fertilizer concentrations with less leaching (10-15 percent) can be just as effective as higher concentrations and heavy leaching. Plant growth rate and environmental conditions: In general, nutrient requirements of greenhouse crops are greatest during periods of rapid growth. Two major influences on growth rate are the inherent growth pattern followed by the plant and the environment in which it is grown. Too much fertilizer during slow growth periods may lead to excess soluble salts; failure to provide enough fertilizer during periods of rapid growth will lead to deficiency. Fertilizers may raise or lower the pH of the growth medium. Fertilizers are rated as to their potential acidity or potential basicity. This value is determined largely by the amount and sources of nitrogen in a formula. Fertilizers that contain more urea and ammonical nitrogen are acidic in reaction, while those that contain primarily nitrate nitrogen are basic. The numbers used to express these potentials refer to the pounds of limestone (calcium carbonate) that it takes to either neutralize (potential acidity) or be equivalent in reaction to (potential basicity) on ton of that fertilizer. For example, 15-16-17 has a potential acidity of 215 lbs. of calcium carbonate per ton of fertilizer. This means it would take 215 lbs. of calcitic limestone to neutralize the acidic effect caused by the application of one ton of 15-16-17. On the other hand 15-0-15 has a potential basicity of 420 lbs. of calcium carbonate per ton of fertilizer. A ton of 15-0-15 would raise the pH of the growth medium as much as 420 lbs. of calcitic limestone. In each case, the larger the number the greater the potential effect the fertilizer on pH. Information on potential acidity or basicity of a fertilizer can be found on the fertilizer bag of most brands. In theory, by alternating fertilizers, the medium pH should be able to be stabilized. In reality, the pH of the medium is a dynamic system and is influenced by many other factors such as irrigation water alkalinity, fungicide drenches and root exudates. The major advantage of using controlled-release fertilizers (CRFs) is that the loss of nutrients from spills during fertigation is eliminated. However, nutrient leaching from the pot can still be as high with CRFs if the rates are too high or if the wrong product is chosen for the crop. In a study conducted at the University of Massachusetts, the same amount of N and water was applied to 4-inch marigolds from water-soluble 20-10-20 and Osmocote 14-14-14. Contrary to expectations, more N leached by 30 days after planting and at the end (60 days) with CRF incorporated in the mix at planting than with regular application of water-soluble fertilizer. The performance of CRF, in terms of N leaching, was improved when the fertilizer was applied to the surface of the mix or when CRF was applied in two smaller doses 30 days apart. Although more labor is required, splitting a single application into smaller amounts and applying them two times during the growing season greatly reduces NO3-N in the leachate. Important factors when using CRFs are the choice of product and rate of application. A single, high rate of a CRF product applied shortly after planting is not recommended for greenhouse crops because large quantities of NO3-N and other nutrients are released at this time when the plants do not need it. Although Osmocote 14-14-14 was used in the study, it is not the best product for greenhouse crops any longer. When using CRFs, use the correct CRF product for greenhouse crops and use the lowest recommended rate according to the manufacturer to control nutrient leaching. This is difficult to achieve when top-watering with a hose because it requires precise control of the volume of irrigation solution applied. Traditionally the recommendation has been to water until about 10-15% of the volume applied drains from the pot to avoid excess soluble salts. In today's terminology this is described as a 0.1-0.15 "leaching fraction" (LF). Most growers probably greatly exceed this LF; probably LFs of 0.4-0.6 are more common. The goal is to achieve a LF of zero, but for many getting the LF down to the recommended range of 0.1-0.15 would be a big step in reducing greenhouse runoff. The best way to stop or limit leaching with an open system is by the use of a carefully-controlled spaghetti-tube irrigation system with drip emitters. Irrigation solution should be applied slowly and in small volumes for the best results. Also, researchers have found that "pulse irrigation" - brief periods of fertigation - is best for efficient application of water and nutrients. Achieving 0 LF with a hose is probably impossible, but reducing LF is possible if the waterer takes the time to observe how much water is applied or how much time passes before leaching begins as each pot is watered. The "fire hose" method of indiscriminate watering is a definite "no-no" with zero leaching! Maintaining a small leaching percentage and reducing the amount of water which misses the pot during hose watering would go a long way toward reducing water consumption and chemical leaching. Most researchers agree that the typical greenhouse fertilizer program provides significantly more P than crops require. There are several fertilizers with low P analysis (e.g., 15-0-15, 20-1-20, 20-2-20) on the market which could be included in a routine fertilizer program to reduce P enrichment of effluent. Also, carried a little farther, incipient P deficiencies have been shown to have a desirable growth-retarding effect on many bedding plants without any foliar symptoms or major delay in plant development. Like chemical growth retardants low P has the greatest growth inhibiting effect during the early stages of vegetative growth. Carefully test this method on a small number of plants before committing the whole crop. Never try to grow a crop without any P! This is the best method for eliminating runoff from the greenhouse and increasing water and fertilizer efficiency because all of the liquid is contained in the system by a water-tight growing area or in a supply tank. Unfortunately this is also the most expensive approach. Since no leaching occurs, fertilizer rate and soluble salts must be monitored very carefully. Fertilizer rate should be about 25-50% less than conventional top-watering in an open system. Many growers who ebb-flood like the way the crops grow and the labor savings in irrigation time so much that they are able to justify the investment and have started adding them to their greenhouses. A lot of water and fertilizer is lost during fertigation from overhead systems as the hose or boom moves between pots. These "spills" may account for as much as 60% of the water and nutrient loss during top-watering. Large improvements can be made here at relatively low cost. See section on irrigation systems. Take some empty round pots and space them pot to pot. Even at this spacing there is a lot of space for irrigation solution to spill as the pots are watered. Some improvement can be made by staggering the rows of pots. Much greater improvement can be made by using square pots and tray to tray spacing of bedding plants. But, did you ever grow poinsettias pot to pot all the way to flowering? Probably not! So, while close spacing reduces water and fertilizer loss, there are only certain crops that will end up of acceptable quality when spaced pot-to-pot. Various types of saucer or collection tray systems can be used to reduce loss from spills between pots and the use of saucers is also an inexpensive way to learn about subirrigation. Some saucers are designed to cover most of the space between the pots, channel the water to the base of the pot, and capture leachate. Simple round saucers hold leachate but are much less effective at capturing spills. Round saucers could be filled with fertilizer solution for subirrigation. Capillary mats have been used for many years for watering and fertilizing plants by subirrigation. They may also be used to irrigate potted plants amended with CRF. A slightly different use would be to topwater the plants and rely on the capillary mat to soak up and hold any spills or effluent from the pots. Of course cap mats can absorb only so much water before they start to drip, so watering must be done carefully. Perhaps this is a way of learning to efficiently apply water with a hose and reduce LF. Cox, D.A. 2008. Organic Growing Media and Fertilizers for Greenhouses.